Estate agents Leaders and Romans, which merged in 2016, have now joined forces when it comes to new homes, creating a specialist team with access to more than 100,000 landlords and investors. The combination of expertise, experience and contacts built up by each company over many years has ensured its joint New Homes initiative has hit the ground running and is already marketing a range of stylish new developments to buyers and investors across the UK. Kevin Shaw, national sales director at Leaders, says: “By merging the Leaders and Romans New Homes teams, we have formed one of the industry’s leading services specialising in the sale of new homes. It allows us to offer nationwide coverage to developers looking for an experienced and trusted estate agents. “We also have in excess of 100,000 landlords and buy-to-let investors who we have worked with, so in many cases we are able to sell a significant proportion of new homes directly to existing contacts on our database who are looking to expand their portfolios. Last year more than 560 new homes were sold by the Leaders Romans Group. Here are just six current developments currently being marketed by the New Homes division. Brighton Marina is home to arguably the UK’s most stunning waterside residential project in recent years. A total of 853 new apartments are currently being constructed across 11 new towers, offering sea or marina views and an immense standard of living. A private concierge service and spacious terraces or balconies are among the highlights. With the first phase of the development already completed, the focal point – a breathtaking 40-storey tower – is now under construction. The ambitious development of Rayne Park in Norwich is set to bring 172 new state-of-the-art properties to the city. A range of one and two-bedroom apartments and two, three, four and five-bedroom houses are to be constructed. Of the 172 new properties, 112 will be built to the prestigious Passivhaus standard, meaning they will achieve incredible environmental performance levels. 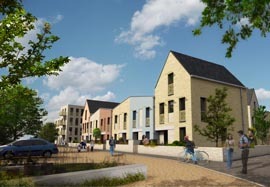 Indeed, Rayne Park is set to become the largest Passivhaus development in Europe. Red bricks, clay roof tiles and materials linked to Norwich’s history as a textiles hub will ensure an attractive finish. Russell House is a stunning new development of high-end apartments in the heart of Brighton. One, two and three-bedroom properties are available to purchase along with an opportunity to secure parking spaces. Russell House was once home to Bupa’s headquarters but it is now being transformed into one of the south coast’s most exciting developments of new homes. All the apartments have been designed to an extremely high standard and to reflect the immense style and vibrancy of Brighton. This luxury countryside development is comprised of just six properties, made up or four and five-bedroom houses. What it lacks in numbers it more than makes up for in quality. A series of elegant specifications ensures buildings are of the highest standard and each home is set within landscaped gardens. Hicks Developments is behind the construction of these beautiful new homes in Littlewick Green, which offers easy access to the M4, M40 and M25. This selection of exquisite one, two and three-bedroom apartments and penthouses within private landscaped gardens is being constructed by award-winning Hodson Developments. The remarkably spacious and stylish apartments that make up the Fitzroy Collection offer open-plan kitchen, dining and living areas, as well as a range of sleek units and integrated appliances. They truly are a blend of modern sophistication and classic construction methods, all of which combines to create new homes of exceptional quality. The Fitzroy Collection is located within walking distance of Bracknell town centre. Mulberry Grove, by Crest Nicholson, has been designed to offer a range of properties suitable for everybody from first-time buyers to even the largest families. It is comprised of one and two-bedroom apartments as well as two, three, four and five-bedroom houses, all set within a flourishing community in Wokingham. This exclusive development benefits from a luxurious specification and the best building features and innovations. For more information please contact the Leaders and Romans New Homes team by calling 0333 9204 412 or emailing newhomes@leaders.co.uk.